In April Wellesley was promoted and became commander-in-chief of all British forces remaining in Portugal, with Prince William of Orange one of his aides. The British pushed forwards and secured victory at the Battle of Talavera. Wellesley was granted the title of Viscount Wellington of Talavera. Further northward, in April the Austrians advanced over the River Inn and took Munich, capital of the Kingdom of Bavaria. Napoleon moved fast and the Austrians were defeated at Wagram, after pulling back from the Danube. In October peace was declared. On 15th December Napoleon and Josephine were officially divorced. In March, Napoleon married the Archduchess Marie-Louise of Austria, in an attempt secure his future conquests. In July, Louis Bonaparte, realising that he cared more for the way that Napoleon's Continental blockade was hurting the Dutch than that his brother had placed him on the throne for just that purpose, abdicated. Napoleon took the Kingdom of Holland directly into the Empire. On 12th October Wellington fell back to the massive defensive lines of Torres Vedras, hotly pursued by General Massena and the French army in Spain. Torres Vedras, a variety of redoubts and fieldworks, frowning lines of trenched and gun-crowned hills, was blockaded by Massena who held his position in front of the great lines, which he dared not attack, until 12th November. Then he fell back to Santarem whence he could still keep Wellington blockaded. He stubbornly held this position until March 1811. Massena made his withdrawal from Torres Vedras and the British followed. On 20th March Napoleon II was born (only to live a virtual prisoner in Vienna after 1815 and die aged twenty-one). Massena finally had to withdraw his army because of illness, lost morale and decreasing supplies in his army. He pulled back on 6th March with the British in close pursuit, constantly skirmishing with the French rearguard. On 13th March at Condacia, the French 95th Regiment suffered some losses, with the 2/95th Rifles also on the scene. In heavy skirmishing at Redinha, the French lost a disastrous fight. Another conflict took place on 3rd April in the Battle of Sabugal during Massena's sullen retreat, acted out in drifting fog and blinding rain. The British won, despite confused order-interpretation by General Sir William Erskine (who was, admittedly, quite mad), with the Light Cavalry Division. On 3rd May, in a battle lasting two days, the two armies fought at Fuentes d'Onore and Massena was defeated. Marmont was placed in command of the French forces, charged with the defence of Spain. Picton with the 3rd Division captured Ciudad Rodrigo on the 8/9th January. The British also captured the Badajoz fortress by April in a siege and vicious battle lasting from 16th March to 6th April. It was during the attack on the great breach at Badajoz that General Craufurd fought his last action. Then, with Wellington pushing on, came the Siege of Burgos, in which the French were for a change undefeated and the British were forced by the arrival of Marmonts army to pull back once more. On 19th July Salamanca was fought, ending in another French defeat, with Marmont losing an arm to a cannon ball. In Russia, the French had declared war and fought the bloody Battle of Borodino against the Czar. Napoleon had as a Reserve force a division of Prussians, forced to take part in the campaign against their neighbours by the Treaty of Paris, though many Prussians were unhappy about this. Later the French retreated from Moscow as Napoleon's Grand Armée fell apart. On the way they were continually attacked, an example being the crossing of the Berezina on 26th-29th November. Once the disaster which befell the main French army had become apparent and pressure from the Russians grew, General Yorck, in charge of the Prussian Auxiliary Detachment, signed the Convention of Tauroggen on December 30th, which neutralised his Prussian contingent, saving them from the Russian retribution which followed the French. Yorck returned to East Prussia in concert with the Russians and, in effect, the Wars of Liberation against the French had begun. On 18th December Napoleon made his last visit to Josephine at Malmaison. The British pushed on towards Vittoria. On June 15th they marched into the valley of Ebro, near the village of Arenas. 18th June and the 2/95th Rifles reach San Milan. Not long after, on June 21st, the French were once more defeated at the Battle of Vittoria and were effectively driven out of Spain. The British campaign moved towards France with a battle at Taroutina on 18th October. By July Wellington was pushing the French back through the hill passes of the Pyrenees towards the French border. They followed the Bidassoa River for a while and arrived in the village of Bera. The 42nd Highlanders landed at Passages on September 7th to join in on the siege of San Sebastian, and blockaded Pamplona while they were there. The French there were greatly reinforced by Marshal Soult. On the 26th the British moved forward to the bridge of Janca. On 10th November they fought at Petite La Rhune in France, moving up to the passage of Bidassoa and of the Nivelle, which forced the French back. From 9th to 13th December there was stern fighting near Bayonne. On the 12th, Soult attacked Sir Rowland Hill's division with his whole force, which had been withdrawn from the rest of the front overnight. But Wellington had foreseen this and had reinforced Hill with the 6th Division. Soult suffered a sanguinary defeat, and the British won a costly victory, bringing to an end the 1813 campaign. The French were forced back towards Toulouse while the British made winter quarters in the Pyrenees, suffering under incessant rain driving at them. They quartered from 14th December to 21st February of the following year. The 6th Coalition was formed in Europe after Napoleon's Russian fiasco; Prussia and Russia joined forces, followed a good while later by Austria. Then the German states came over one-by-one, followed by the Kingdom of Naples declaring its neutrality, despite its king being Napoleons brother-in-law. On 6th September Ney fought Blücher at Dennewitz, losing 53 guns and 22,000 men, double the number of Prussian casualties. On 3rd October the Prussians defeated Marshal Marmont at Wartenburg. A few days later, on the 16th, battle took place around Moeckern, the beginning of the decisive Battle of Leipzig, which was fought against the French by all the allies of the 6th Coalition in what was afterwards named the Battle of the Nations. By Christmas the Allies were crossing the Rhine. Napoleon moved to Fontainebleau to organise the defence of Paris. Blücher headed the Prussian army against Napoleon in the Battle of Laon. Arriving at the gates of Paris on the 30th March, the Prussians entered two days later, led by Czar Alexander, accepting Marshal Marmont's surrender of his army. The British helped by conquering Holland and Belgium under the leadership of General Sir Thomas Graham. Wellington's troops in southern France advanced further into French territory. Breaking winter camp, the British began the year's campaign, starting with battle at Orthez on 25th to 27th February. The French soon fought back in Toulouse as the unstoppable British marched on. Soult knew Toulouse almost with the familiarity of a native. A strong place by nature, he had made it almost impregnable by the energy and skill with which he had multiplied its defences during the long pause before the British advanced. Wellington delivered his attack on three points. Hill assailed the west of the city; Picton the north; Beresford the east. The first two attacks were, perhaps, not seriously meant, and certainly failed. Freire, with his Spaniards, whose task it was to carry the northern shoulder of Mont Rave, fell on gallantly, but was utterly routed, extorting from Wellington the grim comment, "Well, damn me, if I ever saw ten thousand men run a race before!" The Spaniards were seen no more. Beresford's task was perilous in the highest degree; to any other troops than those he led, it might well have proved impossible. He had to toil for two miles along a road which was little better than a strip of marsh, past the flank of Mont Rave, strongly held by the French. On his left was the river Ers. The road was so difficult that the guns were left behind. There was deadly peril at every step that the French might overwhelm the toiling column with a flank attack; or break through between it and the main body of the British army. But Beresford - who had fought at Albuera - was exactly the man for a task which required blind and desperate valour. His men splashed doggedly on their way; on their right the foe, tormenting their flank with his fire; the fordless river to their left; their guns left behind them. When they had reached the southern extremity of the ridge, the regiments brought up their left shoulder, and proceeded to carry the hill. It was seamed with trenches, and bristled with guns. Soult, who saw that this was the one point of peril to his battle-line, had brought up two divisions to the threatened point, and the French, gallantly led, and confident in their numbers, in their advantage of position, and in their success on the other attacked points, came boldly down the hill to crush Beresford's slender and extended line. Nothing, however - not the slippery hill slope, the cruel fire of the French guns, nor the onfall of the solid French battalions - could stay Beresford's men. Soult's columns were smashed with rolling musketry volleys. The batteries were carried with the bayonet, and the hill was won. Directly after Marshal Soult had to pull back from Toulouse news of the French surrender reached the army on the 12th April. In the north, the French had lost the Battle of Vauchamps, and Napoleon had decided to abdicate at Fontainebleau on the 6th, under heavy pressure to do so by his marshals. Napoleon was forced to abdicate his position and surrendered to the Coalition armies, who then occupied Paris for approximately six months, until the Bourbon monarchy was safely restored to its proper place. Then the European countries withdrew to their homelands, maintaining only small forces outside France. Napoleon was exiled to Elba, just off the west coast of Italy, with a personal retinue of about 900 men and officers, something the Russian Czar had argued for on his behalf. The former Emperor of France spent the remainder of the year in total frustration, after being foiled by the British in several escape attempts. On 29th May, a Monday, after Napoleon had accepted exile, Josephine died after catching a chill which turned feverish. Napoleon finally escaped Elba on 26th January, after disguising himself and being smuggled out on a supply ship, and the period of the Hundred Days began, with French regiments pouring over to Napoleon's side. By 19th March he had reached Fontainebleau and Louis XVIII fled from Paris. England hurried her best troops to the Netherlands, where a mixed army under Wellington was assembling. Lieutenant Kincaid's battalion of the 95th Rifles formed part of the 5th Division under General Picton. During the two weeks of waiting to see what Napoleon would do, the 5th Division and the Duke of Brunswick's Division were held in reserve at Brussels, while the rest of the army formed a front line intended to check Napoleon until the allies could concentrate their forces. The 5th Division moved forward to Quatre Bras, passing wounded Belgians and catching the sound of cannon fire along the way. The Belgians were already there, under the command of Prince William of Orange, and had an advance post at a large farmhouse at the foot of the road. Wellington galloped from there along to the Prussian position at Ligny to concert measures of co-operation, before returning to head the action at Quatre Bras, which was very successful, the crossroads being held all day. At Ligny, the Prussians were defeated and fell back to Wavre. On 17th June, in the retreat of the British army from Quatre Bras to Waterloo made necessary by this defeat, the Rifles formed part of the rearguard. Returning to Paris ahead of the slower allies, Napoleon talked of being able to raise a force to protect the French capital from their enemies. But the fight had gone out of the French people, and perhaps some of the higher officers even delayed the Emperor's plans in the hope that there would be no more bloodshed. Only the armies strung out along the French eastern border saw any further action, and those were against vastly superior forces; 210,000 Austrians, and a further 200,000 Russians alone, and were eventually forced to capitulate to circumstance, despite staunch resistance offered to the enemy. On 3rd July the Convention of St Cloud was signed, which allowed the French forces in Paris to withdraw, and the French Provisional Government finally recognised Louis XVIII, who returned on 7th July, just 110 days after fleeing Paris. 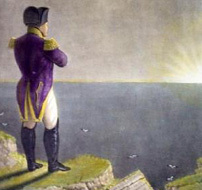 Napoleon surrendered to the British who found him a suitable prison in the rocky Island of St. Helena, in the mid-Atlantic, where the former Emperor would spend the last six years of his life. Napoleon died from poisoning, the substances put into his food and drink by one of his companions, Montholon, a Bourbon supporter. Wellington had survived his last battle and lived to a ripe old age, spending much of his time in politics and serving a single term as Prime Minister.